So finally, when we bought our house, and although that was not a deal-breaker, I was happy to notice a VERY big and wide windowsill in the kitchen, tiled as well (extra useful if you spill water over the plants and the wall, like I do!) and I set about finally buying and planting my herbs. I had a sad-looking deadling of a basil, which when taken out of his miniscule pot grew to extremes, and also some rosemary, thyme and mint joined him soon after. And I got them pretty red pots too, as I wanted a black, white and red theme for the new kitchen. I, of course, wanted the herbs more for eating, rather than decoration, so I thought I would soon deplete them, but they have been growing so fast and well that I keep having to dig out recipes that require lots of them to use them up, as I hate cutting off bits and throwing them away just to keep them healthy. Being Greek I love basil, and the way it makes a whole room smell when you "rub its head" affectionately (yes, you'll see most people, grannies and children alike, in Greece "caressing" basil when they pass by it to release the scent and enjoy it!) and lemons are also so deeply ingrained in my culture that if something's edible, you'll find a Greek squeezing lemon juice on top of it, from bread to meat/fish/vegetables, to olive oil (to make a dressing), to fried potatoes, absolutely anything. This pasta caters to two needs, firstly my basil's "coiffure" and secondly my love for lemony things. Since the other half is not that keen on lemon, while he's away for a long trip to the US between jobs I took advantage and made this one-pot wonder quite a few times, it's so simple and quick, and even vegetarian (knowing me, that's shocking!). Try it, with some ground Belper Knolle on top (a very nice parmesan-ish kind of Swiss cheese wrapped in a layer of pepper, I discovered it one day in a Swiss cheese stall in the Borough Market), or even some za'atar sprinkled in the sauce, and you will not be disappointed. Plus you might have to get a basil plant and slaughter it frequently, to satisfy your need for more of this pasta! Boil the linguine until al dente. Drain but keep a couple of spoonfuls of the water in the pot, and return the pasta to it. Pour in the cream, lemon zest and juice, parmesan, za'atar and basil, and mix well on gentle heat until the cheese is melted. Put in a bowl or plate, grate some Belper Knolle on top and enjoy! Ah... something healthy finally. It's been a couple of months since I've been feeling like I've been eating quite badly, and a recent "your body fat percentage has increased by 5% in the last two years" in my health check report didn’t help in appeasing the evil spirits in my head, so I decided to stop my usual easy-access morning cereal (mainly chocolate based ones, I hate cereal so I have to make it somehow more appealing, although with the things you read on the packs, even the healthiest-looking ones have tons of sugar and salt in them) and start making my own again. 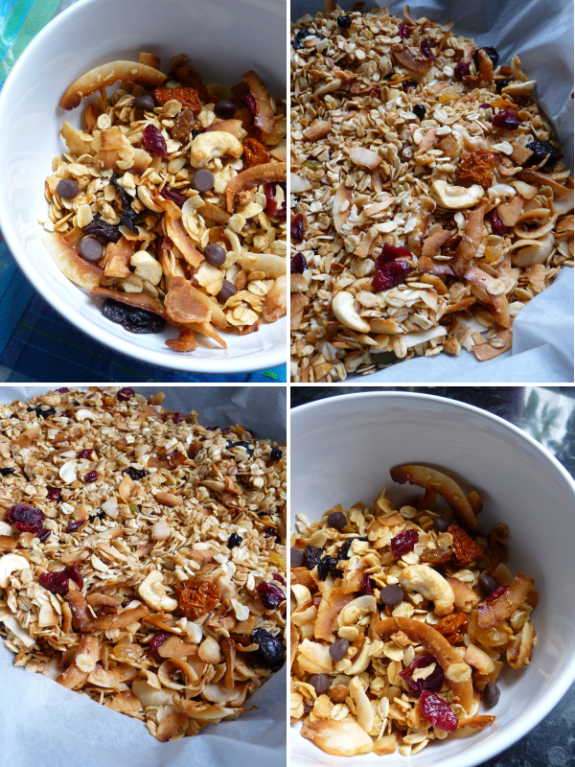 When I first arrived in London back in 2006, I remember I was making every couple of weeks my favourite muesli (I wrongly called it that, as I realise now it's baked, so the right name is granola!) but I hadn't made any in years, and it's something that I really used to love, it's healthy, has no sugar or salt, and kept me going for quite a while in the mornings. Line a big deep tray with greaseproof paper (I use a turkey baking tin). Mix all the ingredients together, apart from the dried fruit and chocolate, and place in the tray. Bake in a preheated oven at 160°C for 20-25 minutes until golden, stirring every 5-10 minutes to make sure nothing burns and the honey doesn't all get stuck in one place. Take out of the oven and leave to cool completely. Add the mixed dried fruit and chocolate drops, mix again, and place in a jar or plastic container with a tight lid. This will keep for about a month, in room temperature. Ah bread... Really, if there is one thing that I miss in this country, it's probably good bread. Something that is intrinsically simple and can be found in every corner in other countries (France, Italy, Spain, Greece...) here is a "gourmet" item, only to be found in posh neighbourhood delicatessens, artisanal bakeries in just a few obscure areas of the capital, and, best-case-scenario, some food markets. All of the above of course sell bread at a cost that would make any French/Italian/Spanish/Greek person laugh and quickly run away... £5 for a focaccia? £4.50 for a ciabatta? £4 for a baguette? Come on, it's just flour, water and yeast, of which 3 ingredients one comes for free through the tap! Facing this frustration of spongy/squishy/bouncy/never-hardening madness, or otherwise called "supermarket Chorleywood process rubbish bread", all these years I had tried many times to make bread at home, with not so great results. I know it's easy, and I know it's simple, but the manual labour of kneading quite a few times, plus all the waiting for it to rise annoyed me, and the end result was nothing like the 1 Euro loaf you can get in any corner bakery in Greece. Plus if you think of it logically, how much money do you charge for your time? If you're getting paid £6 an hour in your normal job, and you take 3 hours to make bread, that means your loaf costs an overabundant £24, which makes it actually cheaper and easier for you to take the train to E5 bakehouse and get some great loaves from there! Hence, the breadmaker comes into the picture! I had never been sure about these things, but when a friend told me that it was great waking up to the smell of freshly-baked bread, I thought I'd go for one. I slowly brainwashed the other half (also a REAL bread lover) over some time, so I finally got one as a nameday present last year! I got the one that was rated as the best at the time (and probably was the most expensive one as well), and I have to say that I love how it makes life easier. Sort of. There are two aspects of it, at least that I have tried, and I'll tell you the results. First, you can make bread the VERY easy way, which is throw all the ingredients in the machine, programme it, and then it does everything on its own, and you wake up in the morning with the aforementioned nice smell. The bread made this way is better definitely than the supermarket ones, but due to the breadmaker bin shape it always will be a squareish loaf, with soft crust. That's ok for sandwiches that are going to be toasted, but if you're looking for something different and crusty, there's the other option. Dough. Same as before, you throw everything in, machine does everything, but DOES NOT BAKE. So it takes less time, and when done you can shape the dough yourself, let it rise once in a warmish place (I use the oven at 40°C as in this country of constant winter no place in my house is ever warmish enough! ), knead a bit, shape, let rise again and then bake. Yes, it's still gonna take up some time off your life, but the main "getting sticky and messy, and kneading 15 minutes till you think a personal trainer would be giving you the puppy-treatment in comparison" thing is gone! Put all the dough ingredients in the order they are mentioned in the breadmaker bin and choose the standard dough programme (mine takes about 45 minutes). Take out the dough and knead for a bit. 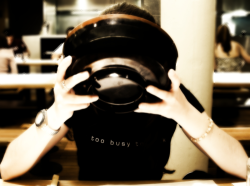 Put in a large bowl and cover with a clean towel, then place in an oven at 40°C for an hour (or until doubled). Take out, roll and pat the dough into a 30cm x 25cm rectangle on a greased baking tray. Make indentations over the dough with your finger, and allow to prove in the 40°C oven for another 30-40 minutes, until doubled. Drizzle with olive oil and sprinkle with rosemary and sea salt. Bake in a preheated oven at 210°C for 10 minutes, then check and return to the oven for a couple more minutes if not ready and golden. We all have things we've liked eating since we were kids (pizza, French fries, souvlaki for me, in about that order of preference), and then there are some things we've never eaten in our lives and suddenly we discover and they become all-time favourites that we cook again and again. For me, these kind of things were mainly added to my diet when I left Greece and came to the hub of international cuisine called Britain (yes, I know most people would snigger at that, but seriously, it's way more advanced than my poor little homeland, and you CAN find pretty much everything you want either in specialised shops or online for any cuisine in the world!). One of the things I had never had in Greece was Thai food, which is now probably my top favourite cuisine, up there with Italian (find me 1 person in the world who doesn't like Italian, and I'll probably... spit on them, but trust me, that person doesn't exist! ), and although you can find quite good restaurants in Britain, you can also now increasingly find Thai ingredients everywhere, from fish sauce to curry pastes, and from kaffir lime leaves to galangal. I don't try to recreate Thai food at home much. We have a couple of good Thai favourites that we usually eat when we go out to Thai restaurants, and those are far too difficult to recreate (or rather look easy but fail miserably every time I've tried) but one of our latest favourites to make at home, especially when looking for something quick and light, and the fridge is empty, are these Thai crabcakes that I first spotted James Martin making in Saturday Kitchen (possibly one of my rare Saturday morning indulgences, if I manage to wake up early enough that is...). Peel the potato and chop it into small cubes. Place in a pot of cold water, with a pinch of salt, and boil until the cubes are tender and a knife easily goes through them (around 15-20 minutes). While the potatoes are boiling, flake the crabmeat, making sure there is no pieces of shell. Drain, return to the pan, and mash as well as you can with a potato masher. Add the butter, double cream, curry, chilli and garlic powder, and mix well. Season to taste with salt and pepper. Mix in the crabmeat until fully incorporated, then shape into 4 balls, and flatten slightly. 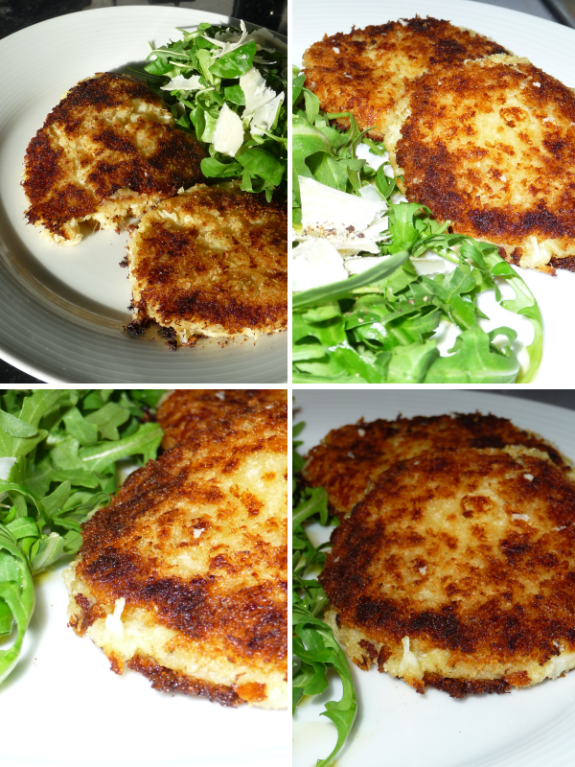 In a small plate spread the breadcrumbs and roll the crabcakes until covered on all sides. Heat the oil in a frying pan and add the crabcakes, cooking them until they are golden on both sides (5 minutes each side). Serve with sweet chilli sauce and some salad leaves. 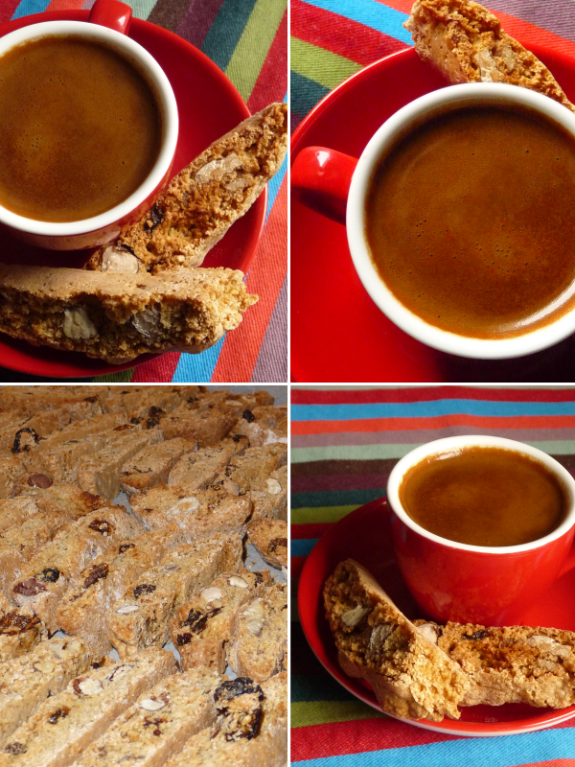 Hmmm... biscotti... The year before last we went to Italy at Christmas-time and spent a few days with a lovely friend and her family, who gave us the best Christmas we've had in our lives... It was so memorable and warm that everything about it wakes up cuddly feelings in me still, and in-between the madness of food food food that we had, I remember something I had never tried before, "ricciarelli", crunchy outside and soft inside, which are some unique cookies from Siena, traditionally eaten at Christmas time with a glass of Vin Santo. We make some similar cookies in Greece (paximadia), which I absolutely love and they follow the same kind of double-baking method, only they are usually flavoured with aniseed. I had never made biscotti before, but neither do I like the hard as cement versions you can find in British shops (I remember even some from Konditor & Cook were inedible without serious coffee/tea dippage), so I thought I would try to make some, to see if a. they would turn out genuine and remind me or the ones in Roma, and b. they would be slightly less tooth-breaking than the shop-bought ones you can find here. They came out quite good, not as tooth-breaking (phew...) and were praised all around. I have to say I'm quite happy with my first attempt, and I'll be trying them again in the future, maybe with some different flavour combinations (pistachio anyone?) 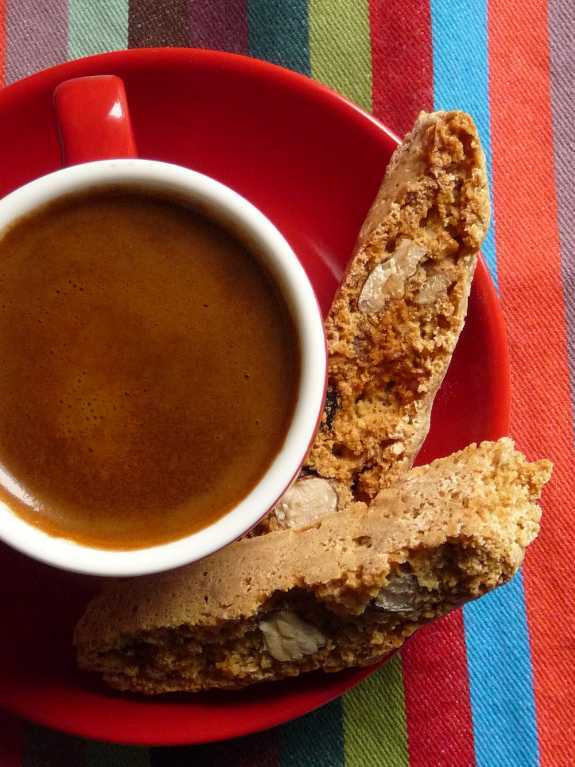 A little caffettino makes this a match made in heaven! Preheat the oven to 180°C. Blend the flour, baking powder, coffee, sugar and the pinch of salt in a food processor for a few seconds, then add the butter and mix until it all looks like breadcrumbs. Add the eggs and vanilla extract and blend again until it becomes a smooth dough. Knead the dough on a floured countertop, incorporating the hazelnuts, walnuts and raisins. Divide into two parts and, using lightly floured hands, shape each into a log of about 20 centimetres long. Place the logs on a lined baking tray, pressing the top down to make it a bit more flat. Bake for 35 minutes. Cool for about 20 minutes, and reduce the oven temperature to 170°C. Cut the logs into one-centimetre slices, place them sideways on the tray and bake for 30 minutes (turning once halfway during the cooking time). Cool, and store in an airtight container, they will last for about 2-3 weeks. My name is Venetia and I'm a self-exiled Greek, "mentally married" to a Mexican and living in London. Apart from the dreary weather, this city is one of the most exciting capitals in the world, and I couldn't imagine of a more diverse place to live (and eat) in. *TasteSpotting/Tasteologie badges designed by Food Doodles.